Sooooo, I’ve got a confession to make…. I’ve kept a little secret for over a year. It’s been a struggle to keep it in and today I can FINALLY share it with you guys! (in)courage is releasing a BRAND NEW CBS Devotional Bible and I have some devotions in it! How cool is that?!? There are 312 devotions written by 122 writers (INCLUDING ME!!!) with stories from women in all seasons of life. There are soooo many more features — each one that has something special just for you! This beauty will be released on October 1, 2018 and you don’t have to wait for it! You can sign up for a FREE 54-page sampler. It includes two full books of the Bible (Esther and Romans), several devotions, reading plans, and more. You can also learn more about the bible by hitting up this blog post by (in)courage or checking out the video they posted today on their Facebook Page. I am so humbled and thankful to be a part of this project. (in)courage has helped me so much in my faith and with life in general. From interning there in college, getting to know all the women on a personal level, and gaining encouragement at some of my lowest points. They’ve walked through so much with me and I truly believe that this bible can help you as you pursue God’s path for your life. Last but not least, I want each and every one of you reading this to know how thankful I am for you. You’ve encouraged me, walked beside me, and believed in me. I’ve always felt called to speak and write but to be honest, I don’t always feel qualified or capable. You’ve walked along side my journey and reminded me that God doesn’t need qualifications to use me. He needs my heart, willingness, and obedience to step out into scary waters. The words I’ve written in this bible come from the heart and they have you in mind. I hope you know that. This entry was posted in Beauty in the Broken, Fearlessness, Growth on August 1, 2018 by Lovelle Gerth-Myers. We live in a world where we can get anything we want with the simple touch of our fingertip. It even includes 2 day shipping. There are so many times I get upset because I am not seeing myself progress in a “timely” manner. There are moments I get mad because my plans aren’t panning out. In those moments I am reminded of Moses. He put in a lot of work. He endured a lot of hardship and listened to A LOT of complaints. After dealing with all of that, he didn’t even get to see the promised land. Friend, life is so hard. Can we just take a second to acknowledge that? It makes you ugly cry and want to scream into a pillow. It can bring out the worst in you. There are times that God will ask us to sit in the hardship. We may not be able to see it but the misery is changing us for the better. The hardship leaves us with bruises and scars that remind us just how human we are. We will fall down and make mistakes. But we will get back up and keep going. We will push ourselves further. Even when we don’t feel like moving anymore. We will look towards that cross because it is full of grace, mercy, forgiveness, and endurance. Consider me your virtual cheerleader. I’m waving around pom-pom’s while you take another step. I’m on the sidelines holding up a sign that says, “go girl!” and jumping up and down with excitement because I know you can win this battle. We serve a faithful God who has a perfect plan for you. As you take life on like a boss, my prayer is that you somehow find His faithfulness woven into your steps. This entry was posted in Beauty in the Broken, Exodus, Fearlessness, Growth, Truth on April 23, 2018 by Lovelle Gerth-Myers. I’m hanging out with my friends at God-Sized Dreams today. I’d love it if you’d join me. This entry was posted in Beauty in the Broken, God Sized Dreams, Seeds for Your Soul on February 26, 2018 by Lovelle Gerth-Myers. On August 28, 2017 after 16 hours of labor and an epidural that decided to stop working towards the end, we welcomed our precious little girl Eula Ellen Myers into the world at 9:03pm. She was born exactly 3 years to the day that I got adopted and gained a family. The Lord is so good. Our chunky monkey weighed in at 9 pounds 4 ounces and was 21 inches tall. Two days into parenthood our little girl was up all night not feeling well. She cried for hours and there was absolutely nothing I could do about it. I’ve been through a lot of pain both physically and emotionally. I’ve walked a dark road full of abuse with a pain in my heart that I don’t even know how describe. I have memories in my head that are full of suffering and agony. I thought that I had learned how to handle any pain thrown at me. As I held my precious baby girl in my arms and rocked her as she cried, my heart hurt in a way I didn’t know was ever possible. With tears streaming down my face, I kissed her chunky cheek and whispered into her ear, “I’m so sorry Eula. I love you so much.” I prayed hard that the Lord would help my little Ellie feel better. I learned in that moment that nothing is more painful than watching your child suffer. Thankfully, the next morning was better. Ellie’s tummy wasn’t upset and she slept peacefully in my arms. As I watched her beautiful eyes flutter in and out of sleep, I realized something that will forever bring peace to my heart when my past tries to come back and haunt me. The pain I experienced while watching my little girl suffer was the same pain God felt when He watched me suffer growing up. I looked at my little girls fingers and toes. I gently kissed her little head and thought about the miracle God created inside my womb. She’s a gift I’ve been given and I’m so blessed to be her momma. I thought about all that she’s going to get to do and the amazing family she’s surrounded with. I thought about what she’s not going to have to experience. She will never go without love and will always be raised to follow the Lord. She has an amazing daddy that she has wrapped around her finger and an adopted family to look up to. Her daddy’s family loves her so much and are such great example’s too. God has given her a new legacy. She will never have to walk the road I walked. There will be so many new experiences we get to do together. Trips to the zoo, family vacations, and maybe we will get to take our first trip to disney land together one day. This won’t be the only time I will watch my child suffer. She’s got her own heart, body, and mind that I can guide in the right direction but in the end, she will make her own choices. She will get sick and she will get scrapes. She will fall down hard but I will raise her to get back up and keep trying. I didn’t realize just how much my pain hurt God until I experienced it myself. Somehow, that realization makes me feel a lot better… When I was going through abuse and hardship I had always told myself that I wasn’t alone but now that I’m a parent, I actually believe it. This entry was posted in Beauty in the Broken, Growth, Healing and tagged Faith, seeds4yoursoul, Truth on September 4, 2017 by Lovelle Gerth-Myers. On January 3rd, 2015 I experienced my wedding day and it was something I will hold close to my heart forever. You see, I come from a family of mostly shotgun weddings. Abstinence was non-existent and elegance was foreign. So as I looked at myself in the mirror with my white dress, make up, and well-designed hair I just couldn’t seem to look away. “Lovelle, do you feel pretty?” my bridesmaid Lindsey asked me. My wedding symbolized so much more than marrying the man of my dreams. 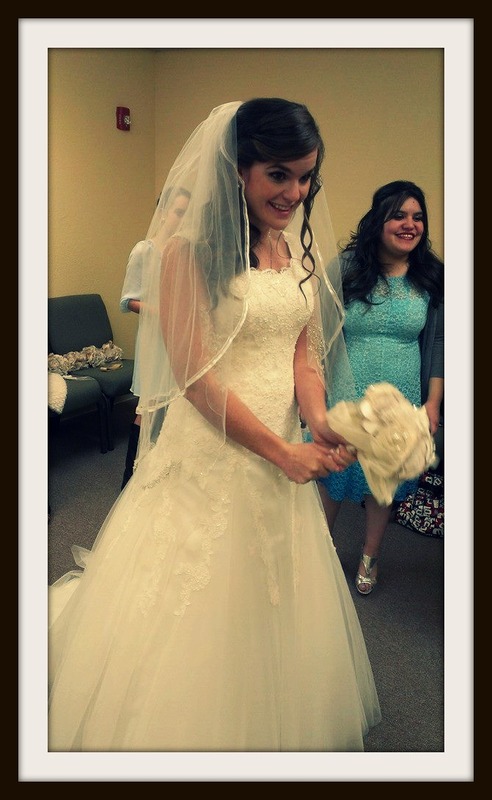 My wedding symbolized the redemption of a horrible past and God’s unfailing love. My husband symbolized a broken cycle and true love with a person God chose specifically for me. As both of our families joined together and prayed around a corner (to keep from seeing each other before the wedding) I couldn’t be happier because even before we said “I do” we were able to start our new life off with a focus on God. I think one of my favorite memories though was the father daughter dance. It wasn’t even two years ago that I was without parents. I remember being on my knees praying to God. All I wanted was to be loved. I never thought it was possible, but God answered my prayers by giving me two amazing parents and I can honestly say they are better than even my wildest dreams. They were worth every bit of abuse. They were worth the long journey of pain. They were worth the confusion and every horrible situation I faced. Its funny to me that the one thing that I thought I would never have in my wedding, God proved to be so. 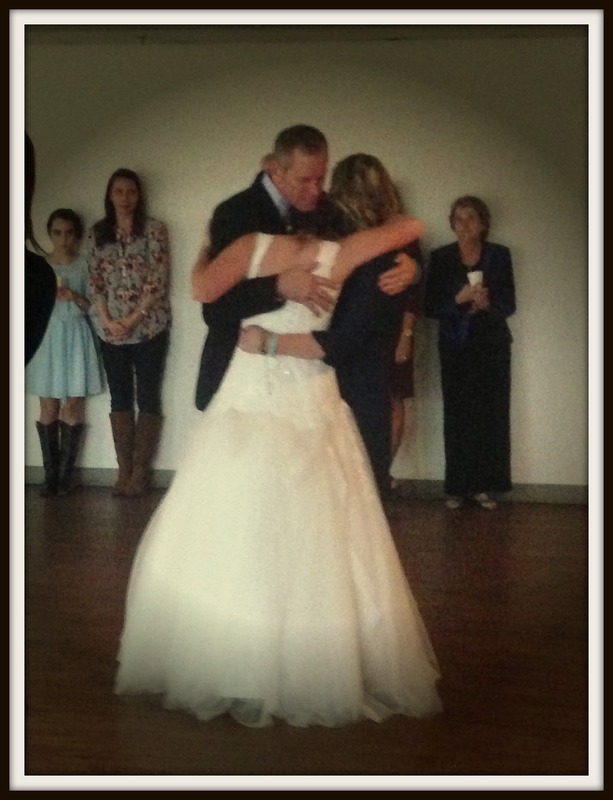 As I took my Dad’s hand and danced to our song I began thanking the Lord for the many gifts He had given me. When the song ended I grabbed my Mom and we all began to cry. We cried because we knew that this wedding wasn’t about us. It was about God, His ability to answer even the craziest of our hearts’ desires, and His ability to redeem. In the past, I never really understood the significance of a wedding but now I do. It was the best day of my life and it was so full of joy. I want to relive this moment for the rest of my life. My marriage was a celebration to God for everything that He has done. It was His love that saved me and it was His strength that sustained me. 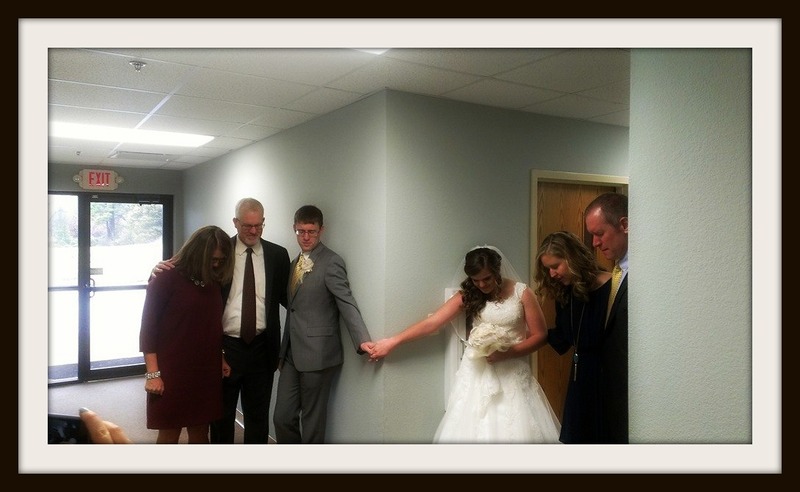 This wedding was proof that everything that was taken from me, God, in his love, redeemed. This entry was posted in Beauty in the Broken and tagged Be Still, beauty, Change, confidence, Contentment, encouragement, example, Faith, freedom, God, Gods truth, grace, Growth, happiness, Healing, Heart, Home, humble, Jesus, leadership, leading, lessons, Life, life lessons, Love, marriage, mercy, peace, responsiblity, shine, standing out, Stepping out, Transparency, true love, Trust, Truth, wedding on January 8, 2015 by Lovelle Gerth-Myers.